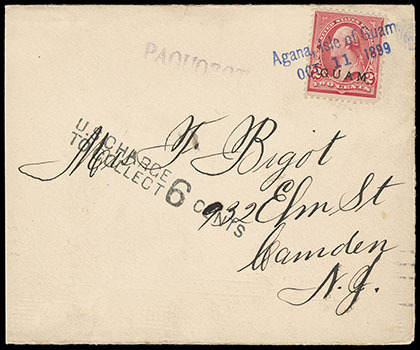 Guam, Agana, Island of Guam / Oct 11 1899, exceptional strike of blue two-line postmark ties U.S. 2¢ red (279B) on cover from soldier to Camden N.J., purple "Paquobot" straightline handstamp and "U.S. Charge to Collect, 6 Cents" handstamp, reverse with San Francisco (11.5) and Camden N.J.; reduced at left, Very Fine and scarce sailor's use. 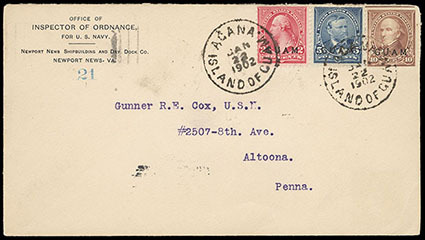 Guam, Agana, Island of Guam, Jan 22 1902, two strikes of cds ties 1899, 2¢ red, 5¢ blue and 10¢ brown (2, 5, 8) on Inspector of Ordnance imprint cover to Altoona Pa., reverse with San Francisco (2.24) and Altoona (3.2) machine backstamps; 10¢ slightly affected by corner placement, Very Fine and scarce. Scott No. 2, 5, 8 Estimate $300 - 400. 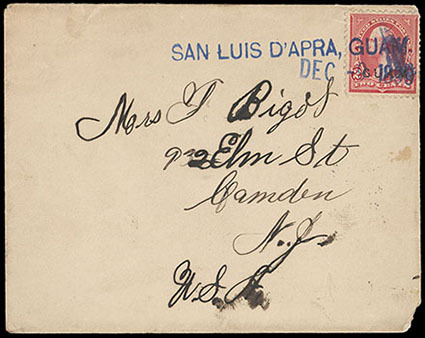 Guam, San Luis D'Apra, Guam, Dec 9, 1899, type 1.6 straightline postmark with separate datestamp in blue ties Guam, 2¢ red (2) on cover from soldier back home to Camden N.J., reverse with partial "Mil. Sta. No. 1 Manila, Phil. Islds. Rec'd, Dec 16 '99" transit and Camden (1.26) arrival machine; corner fault bottom right, F.-V.F. and scarce sailor's use. THE EARLIEST RECORDED EXAMPLE OF THIS GUAM STRAIGHT LINE POSTMARK. 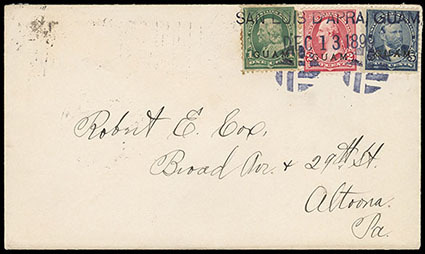 Guam, San Luis D'Apra, Guam, Dec 9, 1899, type 1.6 straightline postmark with separate datestamp in blue ties Guam, 1¢ green, 2¢ red and 5¢ blue (1, 2), along with matching blue "Bear Paw" cork cancels, reverse with "Mil. Sta. No. 1 Manila, Philippine, Received, Jan 6 1900" transit cds and Altoona (2.3) arrival machine; 1¢ corner fault, F.-V.F. and scarce early use, this is the earliest recorded usage of the "Bear Paw" cancel that was used for a short period between December 13, 1899 and February 24, 1900. Scott No. 1, 2 Estimate $200 - 300. 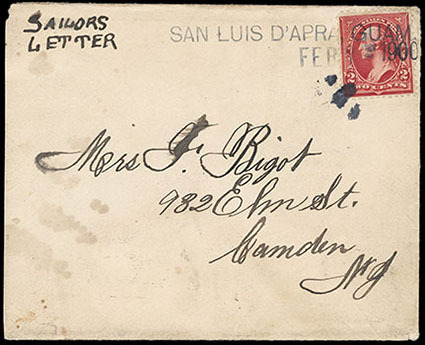 Guam, San Luis D'Apra, Guam, Feb 7 1900, type 1.6 straightline postmark with separate datestamp in dark blue ties U.S. 2¢ red (279B) along with partial strike of "Bear Claw" cancel on cover endorsed "Sailors Letter" to Camden N.Y., F.-V.F. and scarce sailor's use. A late use the "Bear Paw" cancel, known used for a short period between December 13, 1899 and February 24, 1900.